First came the extraordinarily magical fairytale wedding ceremony in Yorkshire, England on 17 January 2015. Followed by the circus-themed poolside banquet in Taipei's W Hotel on 9 February 2015. 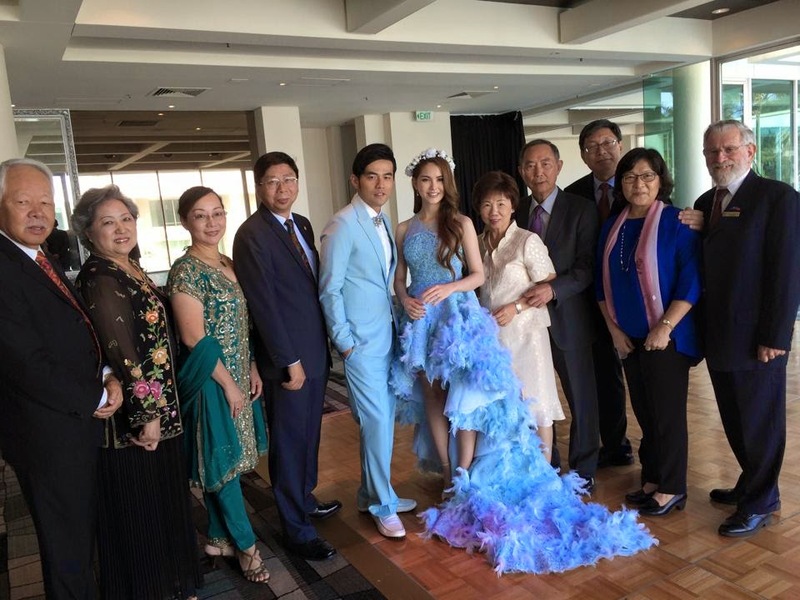 In complete contrast to those (at least in terms of weather and temperature), Jay and Hannah's third and final wedding party, this time for Hannah's family and friends in Australia, especially her grandparents, was held in the hot and sunny environs of none other than the famous Gold Coast's Sheraton Mirage on 9 March 2015. The mercury was definitely in the 30s but the bride and groom, all togged out in matching baby blue outfits had a grand time with about fifty guests, hosting a buffet lunch and taking loads of photographs by the pool and on the beach. 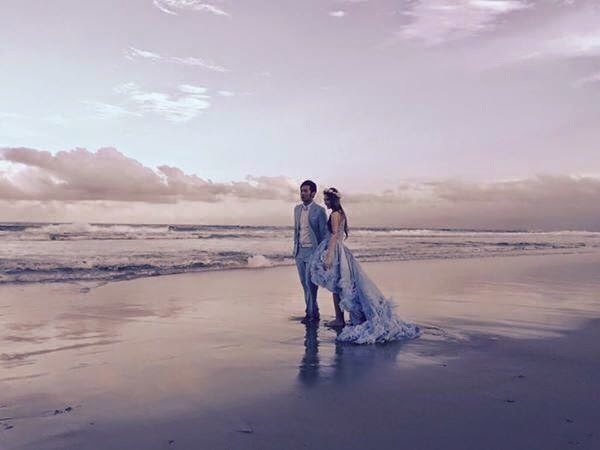 Hannah's father, Patrick served as the emcee for the occasion and when the time came for the couple to enter, he mentioned that Hannah and Jay had something different planned and advised the guests to remain seated. Xiao Mai and Xuegao were spotted outside the door, getting ready and soon, the jaunty introductory strains of Jay's Ukulele was heard and without further ado, the two choreographers danced in. See how elaborate the train was! 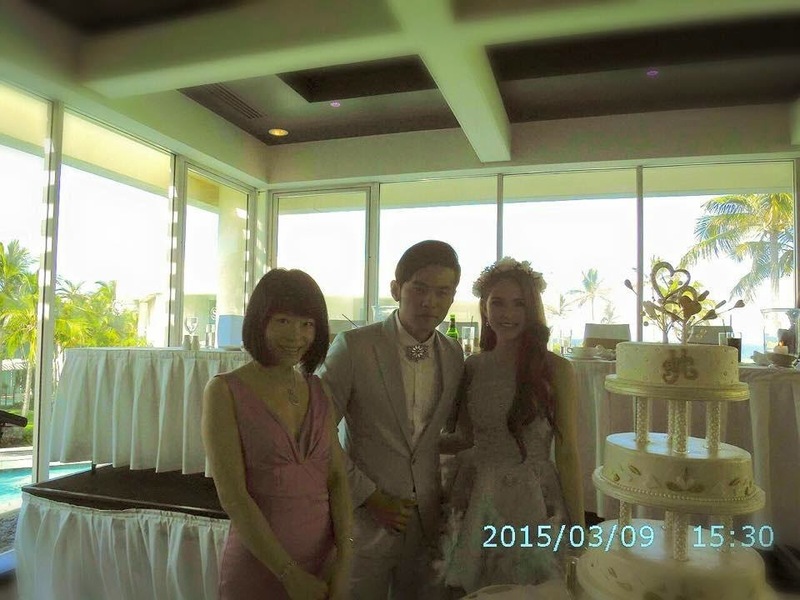 The lovely wedding cake was baked by Charline and her husband from Juno Bakery in Sunnybank, Brisbane. 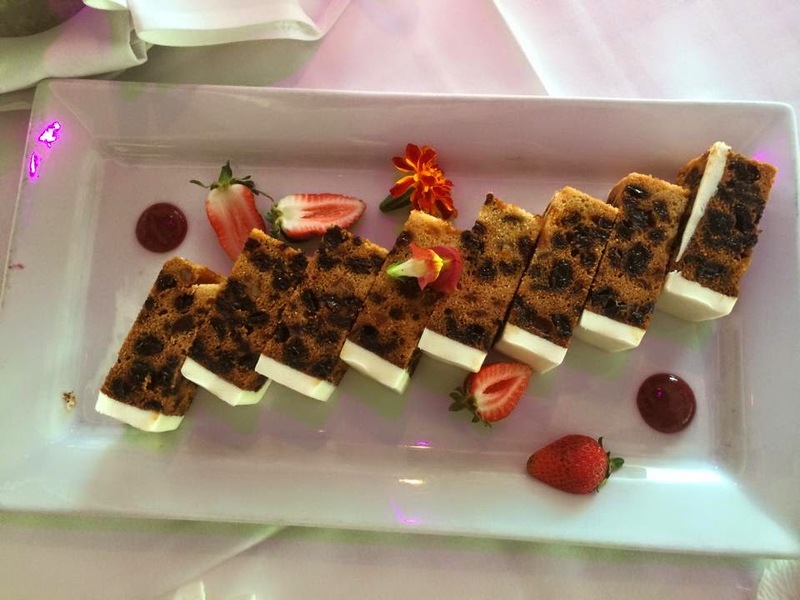 It featured a rich fruit cake with white chocolate fondant and had apparently taken them two whole days to make! 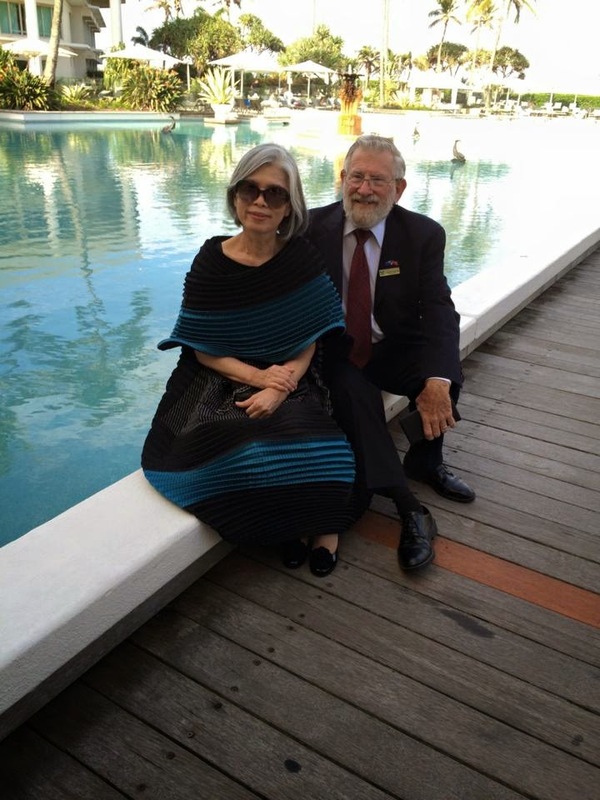 Some other notable guests apart from the family were Dr Dimity Dornan AO, the founder of Hear and Say, for which Hannah and Jay are both Ambassadors. Xiao Mai looks so handsome without his usual cap! Loving his suit! 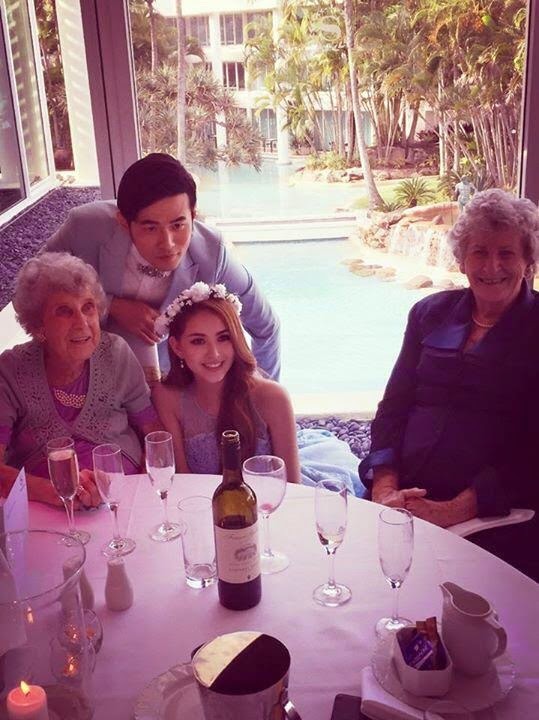 Xuegao's coloured hair matches the bridal couple's outfits...lol! 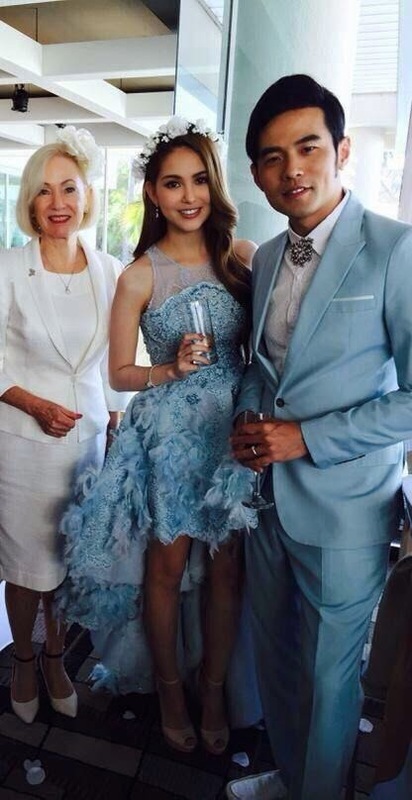 "Jacky Wu was on the guest list Jay made but in the end, Chou's mother prepared the shortlist." As can be seen, Jay's mother was the decision-maker about the guest list. So if he's not happy about being left out, please ask Madam Ye about it and stop going on about Jay. Of course, netizens are now speculating if Hannah is already pregnant but then again, would it be any surprise if she is? After all, she and Jay have made no secret of the fact that they are ready to start a family, so the sooner, the better! Here's wishing them all the best!